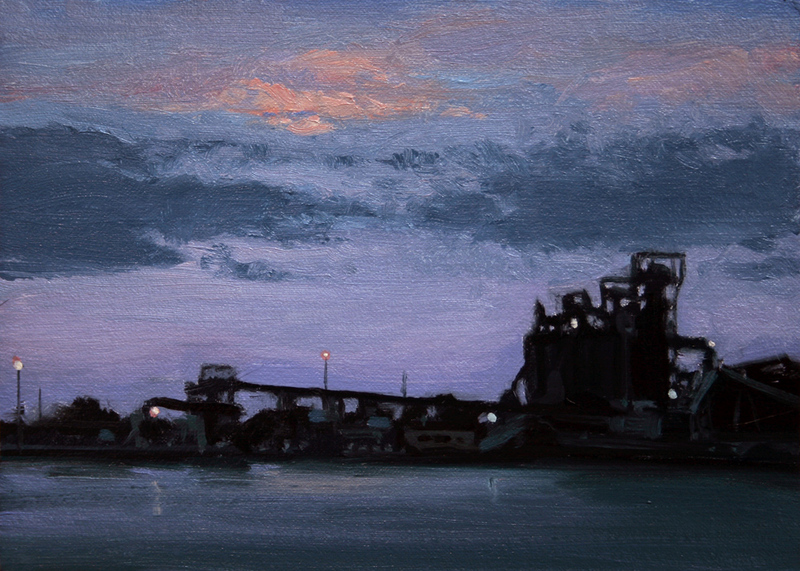 Maumee River Nocturne#2, oil on linen, 5"x7"
Nocturne of Maumee River and the Port of Toledo, the city where I was born. 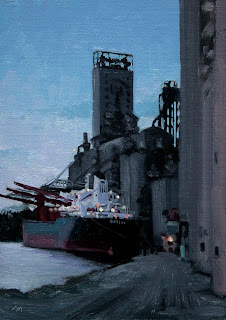 Maumee River Nocturne, oil on linen, 7"x5"
The Barbro loading on the Maumee River, Port of Toledo, the city where I was born. 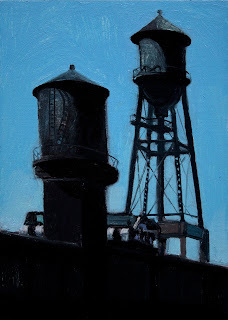 Industrial Tanks, oil on linen, 7"x5"
These industrial tanks are along the railroad tracks in the warehouse district of Detroit, standing as large dark sentinels against a clear blue sky. 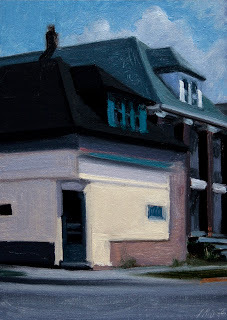 The Corner Store, oil on linen, 7"x5"
A corner store in Hamtramck, the old Polish neighborhood of Detroit. Now one of the most mixed ethnic areas of Detroit. 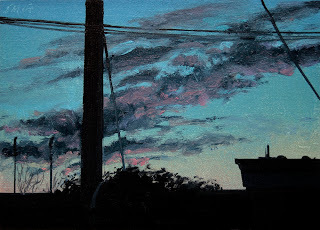 Last Light#02, oil on linen, 5"x7"
Cottrell St. Shadows, oil on linen, 5"x5"
This small industrial building is on Jefferson Ave at Cottrell, in the downriver section of Detroit. 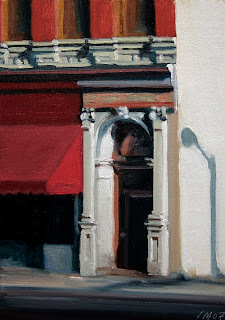 Red Awning, oil on linen panel, 7"x5"
Another downtown Detroit building just begging to be painted. I really enjoy the contrasts in our city. We have new beautiful new sky-scrapers and around the corner you can find these old gems still standing. 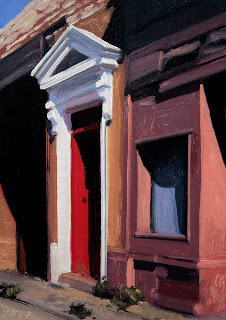 The Red Door, oil on linen panel, 7"x5"
This is another building demolished by neglect. It is along the Woodward Ave. 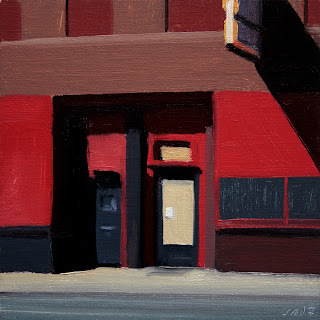 I was really interested in the strong color and shapes the parts of this building created. I have made it past the first 100 paintings. Thanks to all for the encouragement and support! 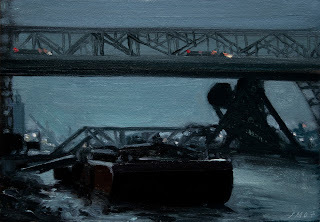 Bridge Nocturne, oil on linen panel, 7"x5"
Another nocturne of the River Rouge Complex. This is a large Industrial area on the South end of Detroit. A wonderful location for an artist. Fisher Bldg. 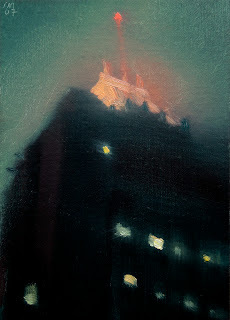 Nocturne, oil on linen panel, 7"x5"
A view of the beautiful Fisher Building at night in light fog. 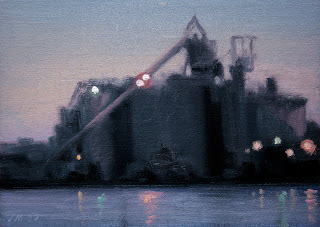 This one was a lot of fun and a challenge to portray fog and not a blurred mess. 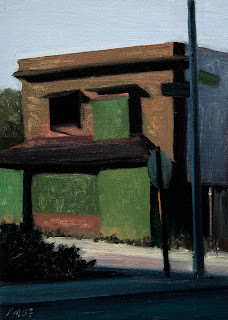 Columbia St. Shadows, oil on linen panel, 5"x5"
This little gem was near the Fox Theater. In the heart of the Foxtown Entertainment area. 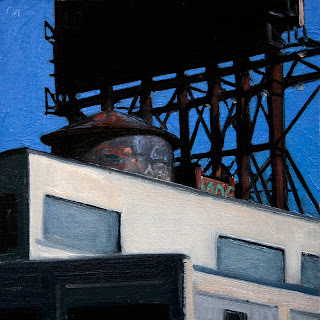 6th & Porter, oil on linen panel, 7"x5". 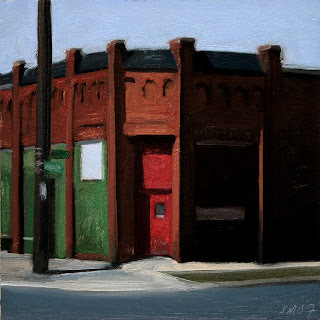 This building is in Corktown, one of the oldest areas in Detroit. A friend lives on the corner and this faced his garden for many years. It was torn down a few years ago. 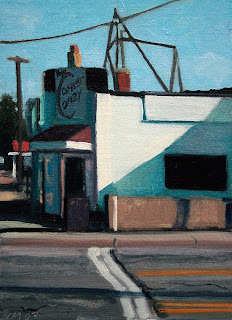 Corner Coney , oil on linen panel, 7"x5"
A corner Coney shop on 4th Street in Royal Oak, MI. We used to live on this Street years ago. 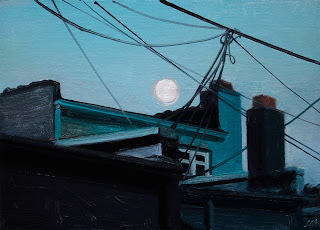 Nocturne in Grey & Green, oil on linen panel, 5"x7"
The seventh nocturne, this is a moonrise over Woodward Ave. down the street where we live. 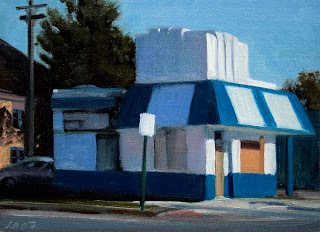 Woodward Ave. Shadows, oil on linen panel, 7"x5"
The building on the right is a vegetarian restaurant. The large pole is the base of a large billboard set in a garden of herbs. I thought that it made an interesting statement. At ground level first glance it is pretty surreal. Kind of a Jack in the Beanstalk. 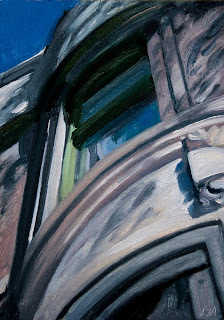 Brush Park Window, oil on linen panel, 7"x5"
of a simple subject. I enjoyed the large range of color in a small range of value. 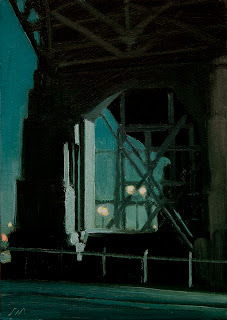 Detroit Nocturne #6, oil on linen panel, 5"x5"
I really enjoyed painting the soft light and edges in this painting, it was a nice contrast to the harder edged paintings I normally do, I may do a new series of softer images. 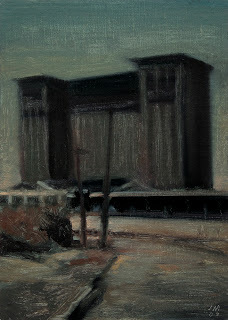 Detroit Nocturne #5, oil on linen panel, 7"x5"
Detroit Nocturne #4, oil on linen panel, 7"x5"
Michigan Central, Nocturne, oil on linen panel, 7"x5"
This beautiful building has been vacant for many years. It was designed by the same architect who did Grand Central Station in New York. It is in a very sad state of condition, but still a powerful image. 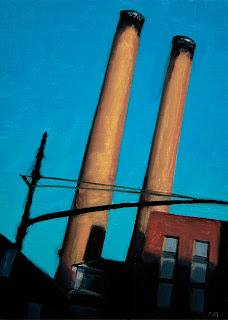 Twin Stacks, oil on linen panel, 7"x5"
Sometimes life just presents itself to the artist. Observe and let yourself get inspired. the color of this evening. The warm glow against the azure sky. in the city where sometimes there isn't much. 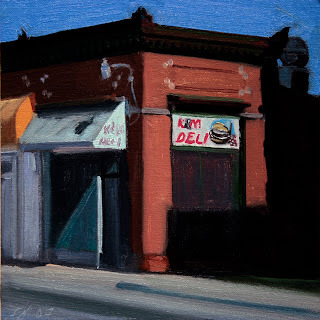 K&M Deli, Brush Park #7, oil on linen panel, 5"x5"
There are so many of these small businesses all around Detroit. This one is in Brush Park. 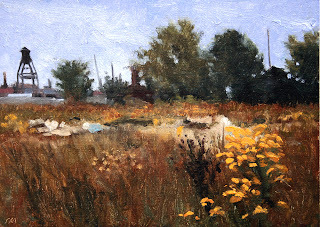 Brush Park #6, oil on linen panel, 7"x5"
This New York scene will be in the upcoming Red Dot Art Fair, Miami Beach, December 6-9, 2007. 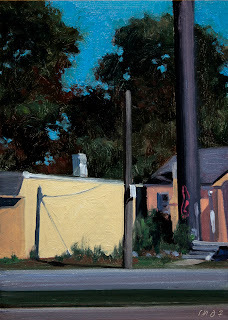 It will be shown by the David Klein Gallery. 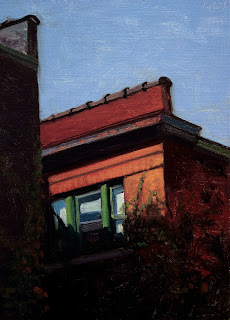 Downtown Shadows, 7"x5", oil on linen/panel. I have no idea what these small corner buildings were used as, this one is for sale or lease, which goes with the hard times in Detroit and Michigan in general. It was probably used as a small manufacturing plant, and is now unoccupied. 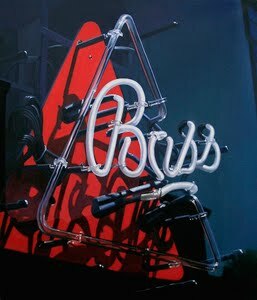 The shadows and reflections make for an interesting painting. I enjoy documenting this era in Detroit, as I hope things will get better soon, and this will be a visual record. 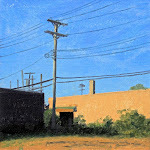 So many buildings over the last 20 years that I have painted are now gone. But they live on in the paintings I have done of them. 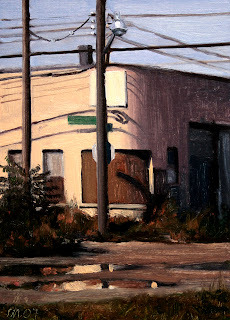 Urban Prairie, Detroit, 5"x7", oil on linen panel. Another Urban Landscape of Detroit's urban prairie. I like the man made elements showing up in the landscape. 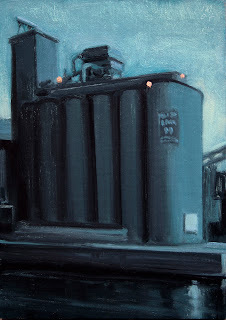 Water Tank, oil on linen, 5"x5"
42"x36", oil on linen canvas. 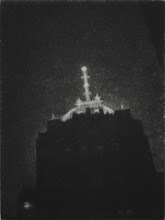 This painting of New York will be in the Red Dot Art Fair, Miami Beach. December 6-9, 2007. 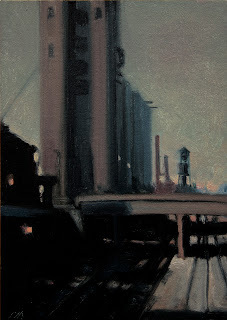 Itwill be shown by the David Klein Gallery. The green window sill coming out of the shadows really caught my eye.